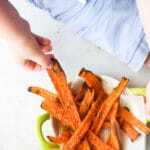 Crispy and chewy, sweet and delicious; these roasted carrot strips are sure to win over even the most notorious carrot haters out there! I have mentioned before how I believe that roasting vegetables is the most child friendly way to serve them. The roasting mellows the flavour of vegetables and helps to release the natural sugars, making them more appealing to kids. Carrots are one of the sweetest vegetables out there, which make them perfect for roasting. When thinly sliced, like in these roasted carrot strips, the caramelisation is taken to a whole new level. This provides the crunchy chewy texture and sweetness that kids actively look for in foods. I can’t even begin to properly describe just how good these are, the photos really don’t match up to how they taste. I made several attempts to capture a photo that gave these carrots justice but I failed. Honestly, you have to try these and when you do you will be hooked. 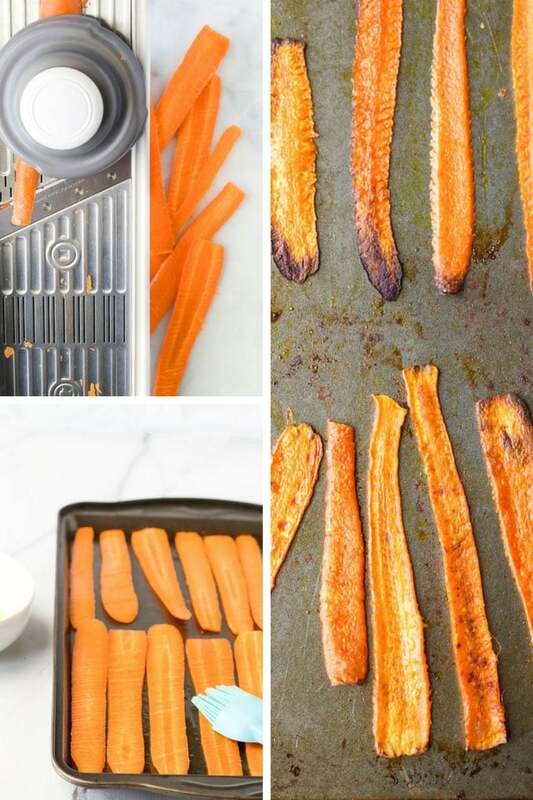 How to Make the Perfected Roasted Carrot Strips. Thickness of your strips – You want to slice the carrots around 2-3 mm thick. If you slice to them too thin they will burn easily, slice too thick and you won’t achieve the same level of crispness. Uniform Slices – I don’t suggest you try to slice the carrots using a knife, uniform thin slices will be very hard to achieve this way. I used a mandoline at the second thickness setting (which is around 2mm). If you don’t have a mandoline then you can use a Y peeler. Lightly Oil – You don’t want to drench you carrots in oil, I find using a pastry brush gets the best results. Lightly brush the carrots on each side before baking. Flip and Watch – Make sure you flip your carrots half way through the cooking time. Towards the end of the cooking time keep an eye on your carrots, they can burn quickly and you want to catch them just before that point. If you don’t feel the carrots are crispy enough, place them back in the oven and keep a close eye on them. Snacks – Great as a snack just the way they are. They taste delicious both hot and cold. Sandwiches – Take your sandwiches to the next level, they give sandwiches a great flavour and texture boost. Lunchboxes – Pop a few in the lunchbox. Part of a main meal – Serve them as a side dish, in Buddha bowls or chopped on top of salads. On the rare occasion that you have any leftover, they will store in the fridge for a couple of days. 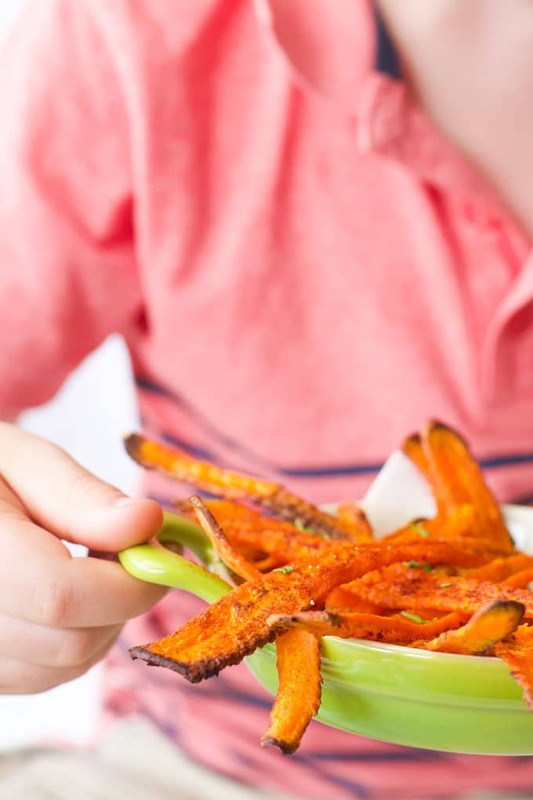 Have you tried these Roasted Carrot Strips? I’d love to know what you and your kids thought. Please leave a comment below or tag me on Instagram or Facebook. 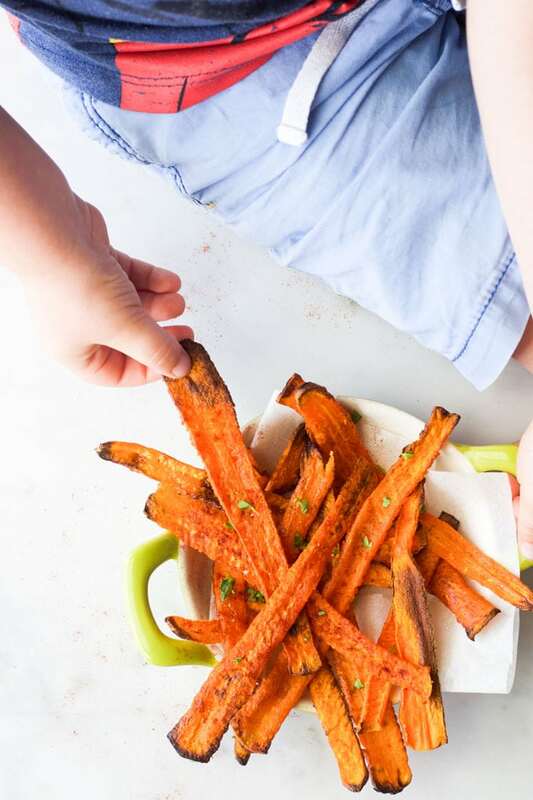 Thin strips of carrots roasted until deliciously sweet, chewy and crunchy. Top and tail the carrot and slice very thinly, lengthways, to form long, even strips . I used a mandoline to do this but you could use a y peeler. I filled two baking trays with carrot strips and my total weight was 450g. This will vary depending on size of carrots and the thickness of the strips. Smoked paprika is optional, I love the sweet, smokey taste it gives. You can leave it out or substitute it for another spice, such as cumin. You may need slightly shorter / longer than 20 mins depending on your oven and the thickness of the carrots. I sometimes roast them for longer as I like the crispy texture. Nutritional information is an ESTIMATE calculated using an online nutrition calculator. It should be used as a rough guide only. I can’t believe how fast these went. They are so addictive. Hi! Can I made this without the Olive oil? Hi, If you don’t use the olive oil I don’t think it would have the same crispy / chewy texture. You could try replacing it with a different oil. Hi Lisa, I haven’t actually tried freezing these, sorry. They never last that long!